There are three 1:64 scale Monster Jam trucks, four crushed car accessories and one crushable RV included! Grave Digger is not included in this set. - The set folds up for easy transport for taking the fun on the go! Never been opened, however back has wear, dents/bends etc. TWO ACTION FEATURES! Fire Projectiles and Cape Reveal! Press to Fire Batarang Projectiles! Press to Reveal Cape! Hot Wheels Monster Jam Batman #32 2015 includes Battle Slammer 1:64 scale NEW! HOT WHEELS - MONSTER JAM. Series: Epic Edition 6/15. 1:64 SCALE. Set of three brand new hot wheels Zoom in. Brand new in original packaging. Packaging does have minor shelf wear. Fast Shipping. One day handling. Buy With Confidence. Message with any questions or concerns thank you. 2017 HOT WHEELS MONSTER JAM 25TH ANNIVERSARY 1/64 SCALE, GRAVE DIGGER TOUR FAVORITES #1/10 WITH INCLUDED TEAM FLAG. THE BEAST #25. HOT WHEELS MONSTER JAM. MONSTER JAM TRUCK. Launch and jump off the bridge ramp to smash Clayface into pieces and free the cars from his evil clutches. Batman style launcher, fly off the bridge jump. Launch into action and send your favorite heroes flying in the ultimate Super Hero rivalry. Colors and decorations may vary. Great gift for any Hot Wheels fan. MONSTER JAM DEVASTATOR MUD 5/6 INCLUDES RE-CRUSHABLE CAR ! MONSTER JAM DEVASTATOR MUD 5/6, INCLUDES RE-CRUSHABLE CAR ! VERY HARD TO FIND ! AGES 3 PLUS. What is up for sale is a Hot Wheels Monster Jam “King Krunch " #B1295 car from 2002. Condition: card is in very good condition or better. Dual cars. One is Batman and other Superman from DC movie Batman versus Superman. New on card. Great for your collection. Exclusive buy at Toys are Us. Message me with any questions. Shipped when money is received. Thank you and have a great day. 50th ANNIVERSARY. JUSTICE LEAGUE. HOT WHEELS. These cars are IN Good TO Mint, condition. The car in the picture is the exact car you will receive. HOT WHEELS. You are BUYING the car titled above. & BATMAN THE. Hot Wheels. Hotwheels Batman The Riddlers Rampage DC Comics 1/64,NM Condition! This is a very cool Hotwheels set Tittled The Riddlers Rampage, 3pc. 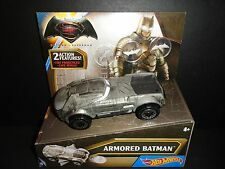 set includes Batmobile, A very Cool Riddler car, &; A Batman figurine it is 1/64 scale Brand New in NM condition, i am not an expert grader, but i dont see any issues with this item! 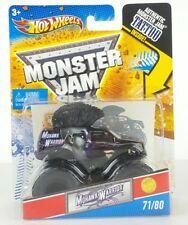 2004 Hot Wheels Monster Jam Mini Monster Truck. Predator truck. Card and truck are as pictured. New Baby Sale! We have a new addition to our family so All my collectibles must go! Cards may have soft or dented corners and/or creases from shelf wear or the manufacturer. 2019 Hot Wheels Batmobile #128 F Case Scooby Doo & Batman Screen Time Lot of 2. Condition is New. Shipped with USPS Priority Mail. 2011 Hot Wheels Batman~"Batman Begins" Batcopter~ 1:64, New! This is a Mattel Hot Wheels Vehicle , Dated 2011, & Titled Batcopter, Package is Themed for The Major Motion Picture "Batman Begins", With some Great Graphics!, it is nicely casted & detailed 1:64 Scale Replica, Made for DC Comics/WB Studios, Part of The Batman Series, It is # 4 of 8 in the series!, It is Brand New!, Never Opened!, Has some Edging & Soft bottom corners!, ( Please see photos), Thanks for looking!, & please check out my other listings!, All orders are packed securely to help prevent shipping damage! The Animated Series. Hot Wheels. HOT WHEELS 2015 BATMAN BEGINS BATMOBILE. Condition is New. Shipped with USPS First Class Package. Hot Wheels Monster Jam “Monster Mutt”. Condition is Used. Shipped with USPS Priority Mail. W/ CRUSHABLE CAR. MONSTER JAM. HOT WHEELS. Up for grabs is this Hot Wheels batman the animated series car. New in package and factory sealed. Package is great condition and has normal shelfwear. Please view all of the photos to confirm the condition this item is in. The item you see in the pictures is the actual item you will receive (not stock photo). Check out my other listings for more GREAT TOYS Any Questions please don't hesitate to ask. Thanks for looking!!! Perfect set for any collector / Hot Wheels lover! Included is 1 Hot Wheels NIP item! Up for your consideration is a beautiful new in box set.